Please make sure you have entered correct email address. You will receive a reply from us about how to secure your reservation. As online booker, you will be accommodated on first flight for the date booked. Please check your junk / spam folder if you do not receive a reply. The form could not be sent, please try again! A ballooning experience worthy of kings and queens. The best way to discover and explore Cappadocia. A ballooning experience that you will remember for life. Cappadocia Hot Air Balloon Rides are one of the best ways to discover and explore the area of Cappadocia. While you are soaring between the rock formations in the deep valleys of Cappadocia onboard your Hot Air Balloon, you will close your eyes and listen to the sound of silence and peace. Cappadocia Balloon Flights are getting more popular every year due to perfect weather conditions and amazing scenery which Cappadocia offers to the guests from all around the World. 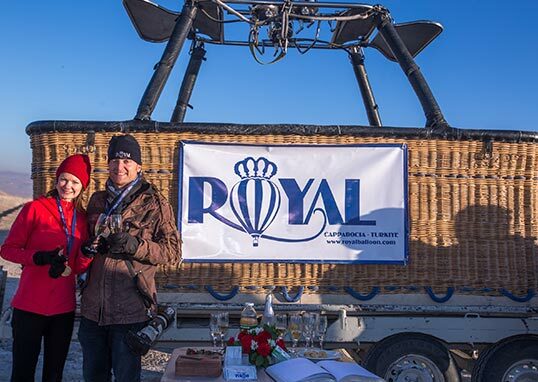 Royal Balloon - Cappadocia is an ISO 9001:2008 Certified Ballooning Company, "Top Rated on TripAdvisor", a proud "American Express Selects Member" serving "Royal & Exclusive" Cappadocia Hot Air Balloon Flights over the spectacular and breathtaking lunarscape of Cappadocia. Experienced - Worldwide known Hot Air Balloon Pilots of Royal Balloon - Cappadocia will be delighted to see you on board and take you for an unforgettable Cappadocia Balloon Tour. 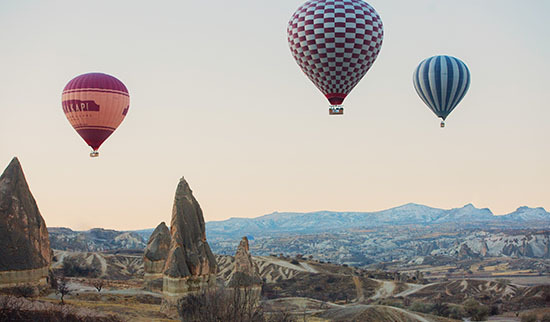 Ballooning in Cappadocia, is without doubt a "must do" and let us treat you Royal with a Luxury and Exclusive Hot Air Balloon Adventure over Cappadocia. Ask for Year 2019 Special Rates. The pick-up and drop-off times are subject to change depending on seasonal and climatic conditions. We look forward to the opportunity of giving you the ROYAL experience of a lifetime and we thank you for choosing ROYAL BALLOON. 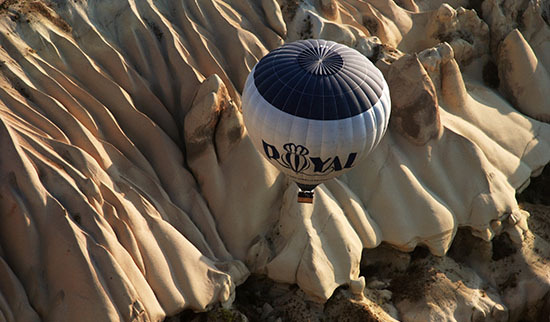 For more detailed information about Royal Balloon - Cappadocia (more detailed explanations, balloon ride cost etc. Please click here to download our Infosheet. The Infosheet is in Adobe PDF Format. If you don't have Adobe Acrobat Reader, please click here to download it. 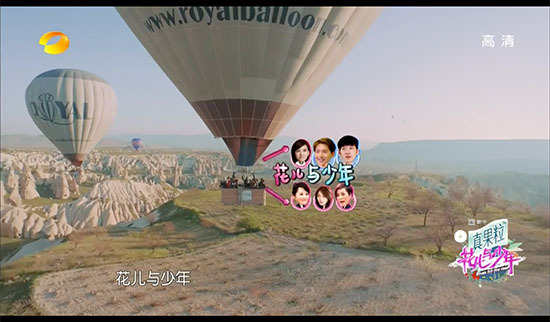 Royal Balloon has been Featured on Television before, but we were extremely proud to have the famous Divas Hit the Road (Famous Chinese Reality Show / Hunan TV) Team onboard on one of our flights for their Cappadocia Balloon Tour during their journey through Turkey. Their adventure in Cappadocia was aired in Episode 9 (Season 2). Please click here to watch the part about Royal Balloon on Divas Hit The Road. Martha Stewart (the Famous American Television Producer, Commentator, Gourmet and Author) came to Turkey for the shooting of Martha Stewart Show which was aired in the United States. Stewart came to promote Turkey with an official invitation and during her visit to Cappadocia she had an Unforgettable Hot Air Balloon Flight with Royal Balloon. Martha Stewart’s television program aired on Hallmark Channel on October 1st, 2010. Please click here to watch the part about Royal Balloon on Martha Stewart Show. 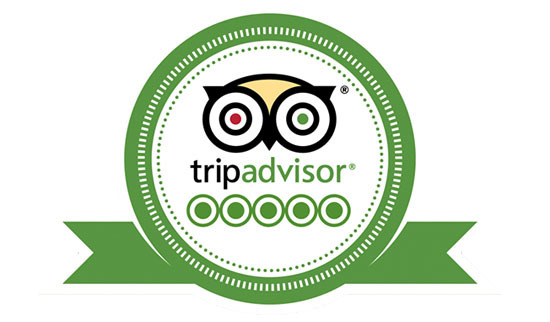 We at Royal Balloon put great effort into Passenger Satisfaction and are proud to be listed as the Best Balloon Company in Cappadocia on the most popular travel portal: TripAdvisor. 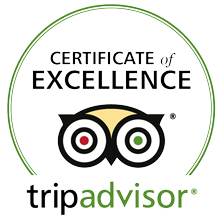 Beside our Top Ranking we also have Highest Number of Authentic Reviews among Hot Air Balloon Companies in the World on TripAdvisor. 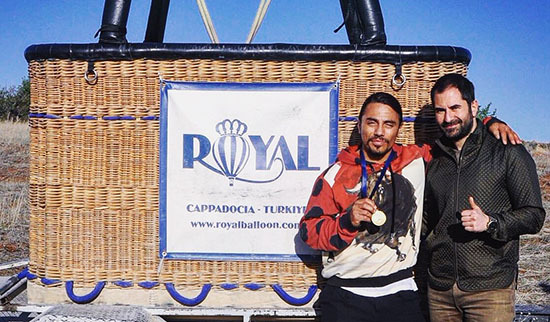 This makes Royal Balloon the Most Popular Balloon Company in Cappadocia and One of the Most Popular Balloon Companies in the World. As a result of our hard effort for Consistency of High Quality we have been rewarded with “Certificate of Excellence” for Years in a Row. It is important to fly with a Reliable Hot Air Balloon Company to make the most of your Cappadocia Balloon Tour experience, as most of you will only fly balloon once in a lifetime. We at Royal Balloon are lucky to fly with Celebrities from All Over the World. The following have experienced their Ballooning Experience in Cappadocia with Royal Balloon: Her Majesty the Royal Queen and Princess of Bhutan, Mr. Ahmet Davutoglu (Former Prime Minister of Turkey) and Family, Mr. Mahindra and his Family (owners of Mahindra Group - India), Mr. Arun Nanda (CEO of Mahindra Group), Mr. Ng Eng Hen (Minister for Defence of Singapore) and his Family, Ellen Burstyn (Oscar Academy Award Winner), Eva LaRue (CSI Miami Star), Rubens Barrichello (Formula 1 Pilot for Ferrari), Nur Fazura & Shaheizy Sam (Malaysian Superstars), Gulben Ergen - Kivanc Tatlitug & Basak Dizer Tatlitug - Ece Erken - Cigdem Batur (Turkish TV Stars), Chef “Nusret” Gokce (Salt Bae), Yoko Yamamoto (Japanese Artist), Kubat (Famous Turkish Singer), Mehmet Altan - Murat Yetkin - Osman Tanburaci (very well-known Turkish Journalists) and many more. Please click here for our Gallery section with photos of the celebrities. We operate with minimum amount of Hot Air Balloons that are built by the Most Prestigious Hot Air Balloon Producers in the World: Cameron Balloons & Lindstrand Balloons (both made in the United Kingdom). This makes Royal Balloon the only Hot Air Balloon Company in Cappadocia that is operating a 100% British Fleet. These balloons are one of the only New Generation Balloons with Hyperlife Silver Coating in Turkey (assuring Highest Safety and Flight Performance due to the material used). Royal Balloon - Cappadocia, with an Excellent Safety Record, puts great importance into Safety of Ballooning for you to have the Safest Balloon Experience in Cappadocia as possible by using Equipments of Only Highest Quality and is among One of the Safest Balloon Companies in Cappadocia. Please click here for more details of our fleet. Royal Balloon is the First Hot Air Balloon Company in Turkey to be accepted to the Prestigious and Luxurious award program: “American Express Selects”. Royal Balloon also have memberships in ASTA (American Society of Travel Agents - We are the only Hot Air Balloon Company from Turkey), BFA (Balloon Federation of America - We are the only Hot Air Balloon Company in Turkey which is accepted as Corporate Member), BBAC (British Balloon and Airship Club) and KAPTID (Cappadocia Touristic Hoteliers and Operators Association). Royal Balloon is recommended by the following guidebooks / travel websites: CNN International, Forbes, Lonely Planet, Frommer's, Turkey Travel Planner by Tom Brosnahan, 1000 Places to See Before You Die!, Kiwi Collection, Rurubu (Japanese), Time Out and many more.